On October 16, 2017, LSU Law students Jessica Thomas, Lacey Sanchez, Erin Abrams, and Jacob Irving, under the guidance of Professor Robert Lancaster, argued before the Bar of the Louisiana Supreme Court. Their task, to represent Reggie Patrick Thibodeaux, an indigent criminal defendant seeking his pro se Motion to Suppress be considered by the court. The question, did the trial court err when it refused to consider the defendant’s pre-trial Motion to Suppress, citing Mr. Thibodeaux’s status as a represented defendant as the sole reason for the refusal? Thibodeaux was arrested in November of 2016 pursuant to a stop and frisk, which he contends was unlawful, and shortly thereafter was assigned a public defender. In time he came to fear that his counsel had abandoned a prior Motion to Suppress, as the public defender never answered the trial court’s order to show cause as to why the motion to suppress should be granted. This led Mr. Thibodeaux to file his own pro se Motion to Suppress, which the trial court dismissed without reconsideration. On March 31, the Louisiana Court of Appeal, First Circuit, vacated the trial court’s dismissal of Mr. Thibodeaux’s motion and remanded, emphasizing that the trial court must accept and consider a pro se filing of a represented client in a pre-verdict context so long as no resultant confusion would occur at trial. Less than a month after his appeal was granted, Mr. Thibodeaux’s public defender requested and was granted a stay. 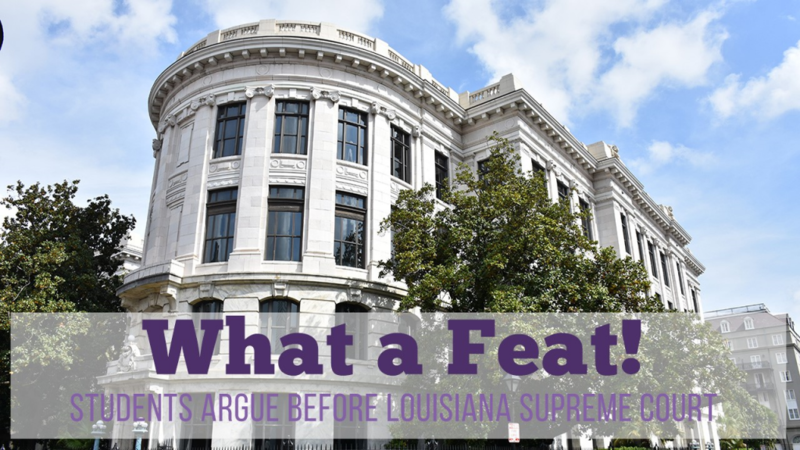 This action delayed the criminal trial absent any consideration of the motion to suppress and brought forth the case argued by the team from LSU Law. Mr. Thibodeaux’s case touches at the heart of the client-lawyer relationship, a relationship based on trust and one that is a sacred touchstone of the law, and raises the question: Who has ultimate control over the direction of their criminal defense in Louisiana, the principal-defendant or the agent-counsel? One’s heart would say the defendant; however, the answer will be revealed come December when the Court renders its opinion. Regardless of the outcome, the LSU Law Center is extremely proud of the hard work and dedication this team put forth in advocating on Mr. Thibodeaux’s behalf.